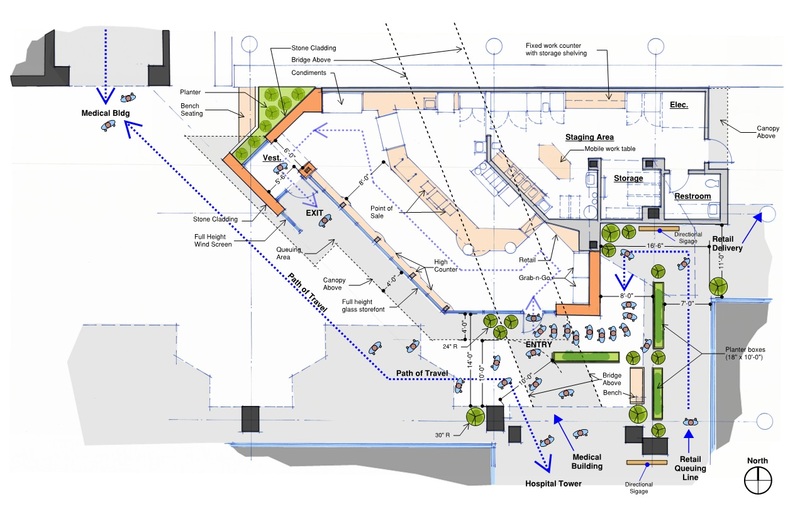 How to General Contractors help a project Owner Visualize the Project’s Percentage of Completion? It’s difficult. I’ve seen many spreadsheets, reports, thousands of photos and AIA Schedule of Values all attempting to convey to the owner just how far along their project is. The problem is most owners need visuals. Photos are great for seeing what’s done but it’s a lousy way to convey an overall status on the project. 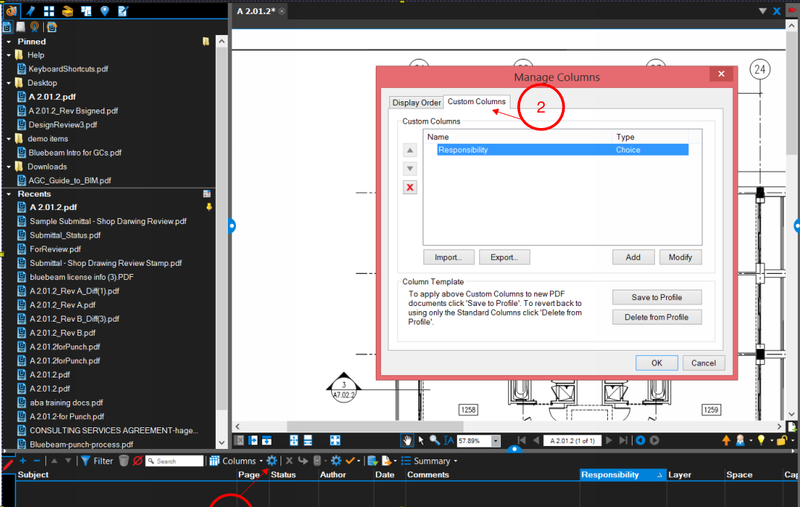 There is a better way with Bluebeam Revu by creating a custom tool set and utilizing custom statuses in the worklist. Understanding what is done, who you are waiting on, and how the project is progressing can be difficult to convey. Especially in complex projects. 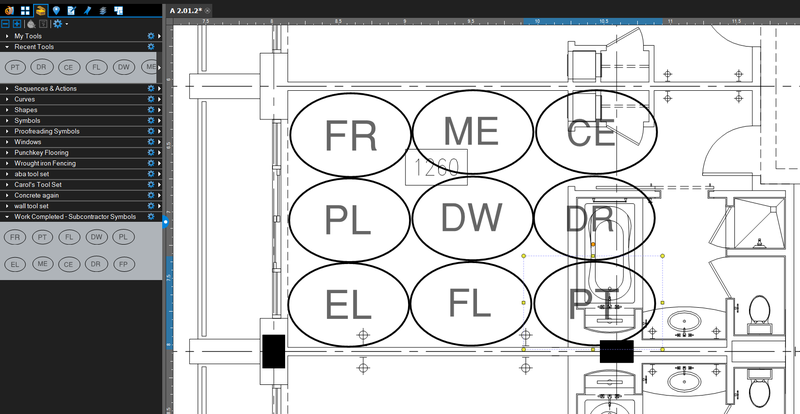 Using a simple approach with the floorplan, setting work areas (using spaces) and embedding symbols for each trade (a custom tool set) in all work areas can help. 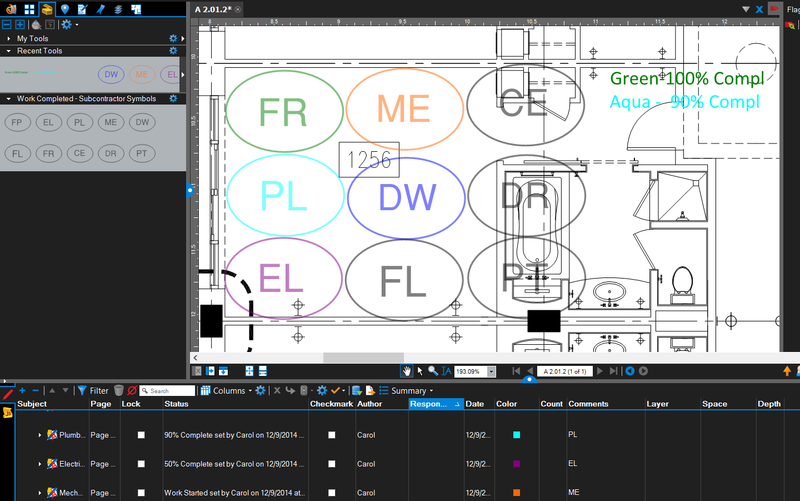 The status and color of the trade’s symbol in each work area can convey whether materials are staged, what’s started, what’s 50% complete, what’s finished, etc., and when all trade work is complete in a work area, the entire space can be colorized as complete. Just slap a legend on the floorplan and the owner will understand without having to analyze spreadsheets or read a report. 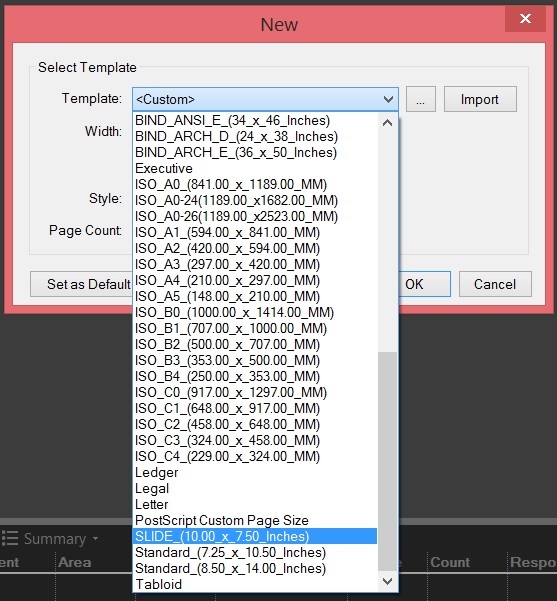 Creating the custom tool set can be a little tedious. 1. 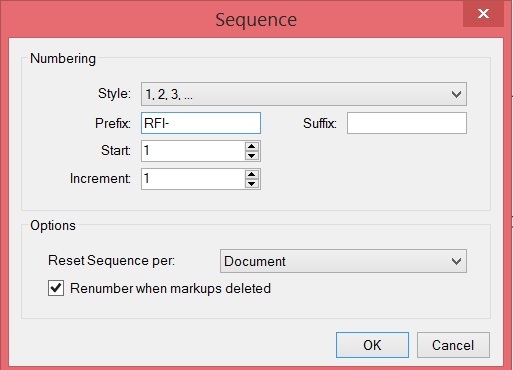 Place an Ellipse markup on a PDF in an oval shape. 2. 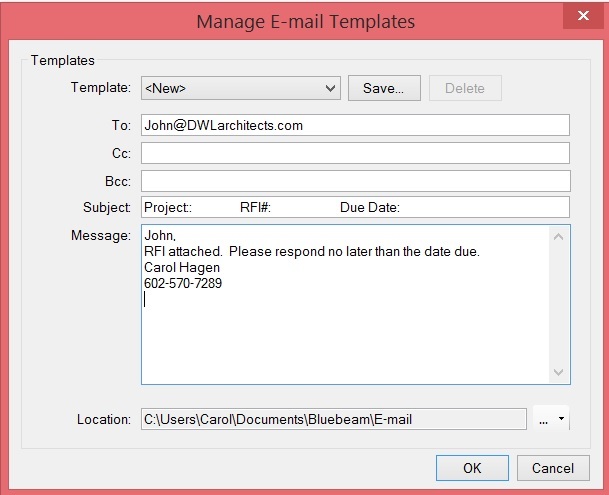 Add a text box inside the oval with a 2 character abbreviation for the trade. 4. 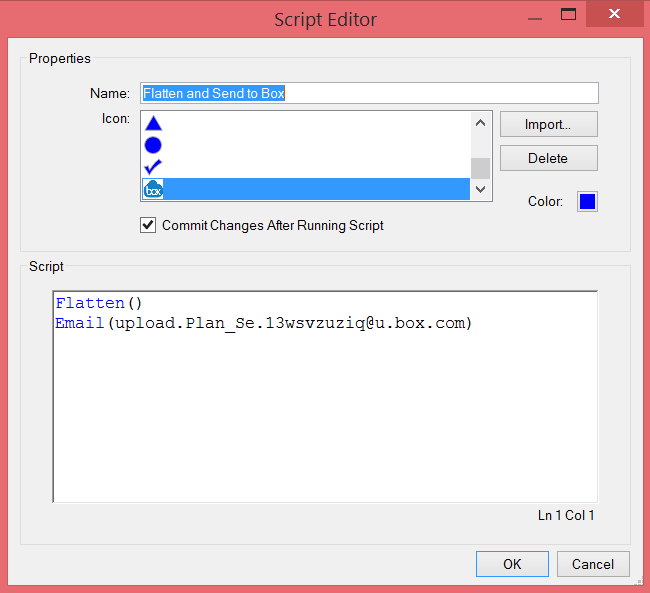 Change the Properties of this tool and provide the full name of the trade (ie. electrical, drywall, etc) You may also want to change the opacity. 5. 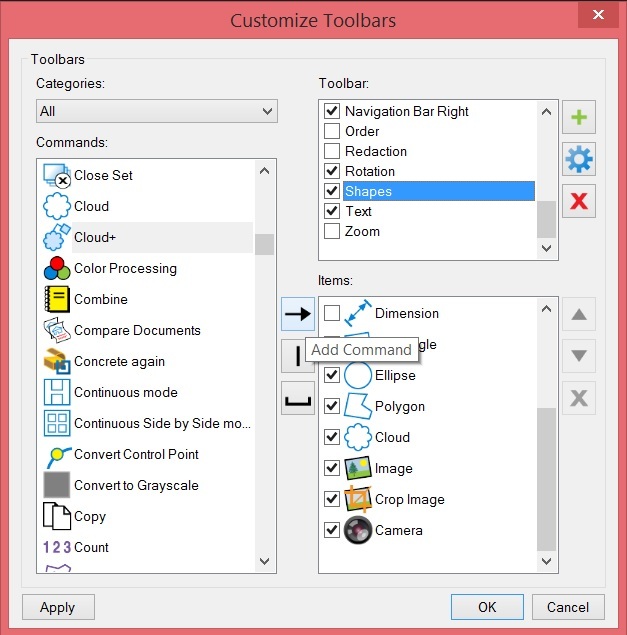 Add this tool to a new tool set in your tool chest (you may want to call this Work Completion by Trade/Specialty/Sub or Work Pct Compl by Sub), either by right clicking and adding to a tool set or dragging and dropping the tool from the Recents Tool Set to another tool set (as the recents will clear when you close Revu). 6. Repeat for as many trades as you want to track. 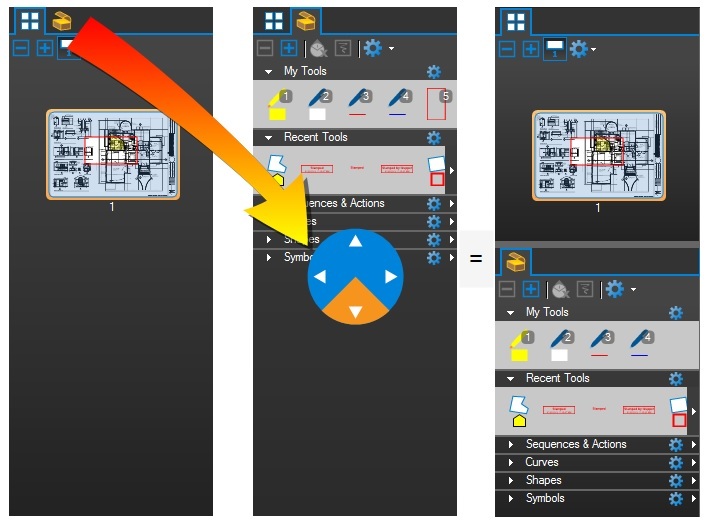 To help all my Bluebeam readers, I’ve created a tool set for you that you can import and use as a template to get you started with 10 symbols for Framing, Plumbing, Mechanical, Electrical, etc. 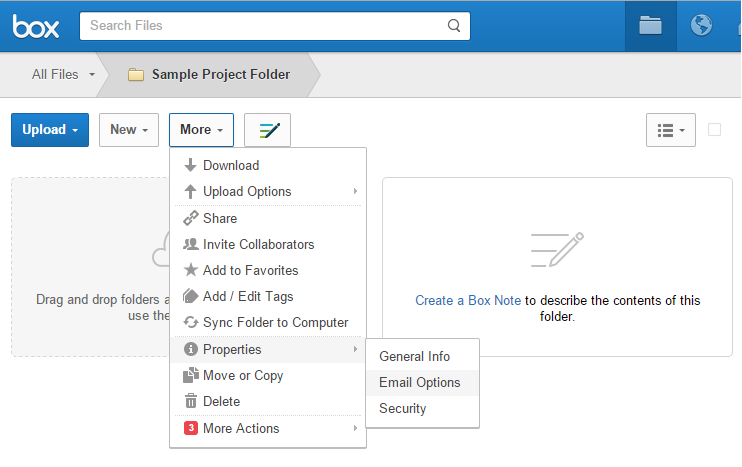 Click here to download this tool set and make modifications. 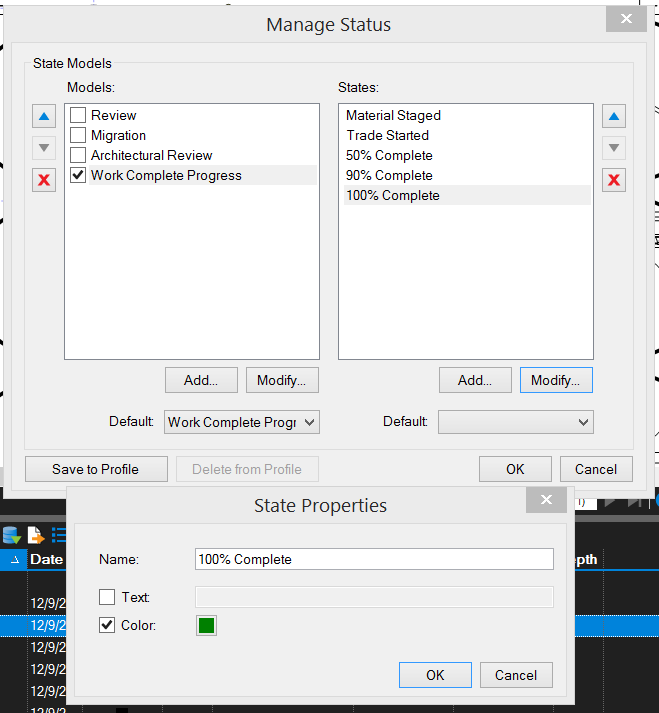 I suggest you create the custom Status Model detailed below and tool set in a Custom Profile called Work Completed Status for Owner. Consider it a early Christmas present as I know all Bluebeamers have been good this year! Once you have this imported into your tool chest, you’ll want to create your own custom statuses for Material Staged, Trade Started, 50% Complete, 90% Complete, 100% Complete. 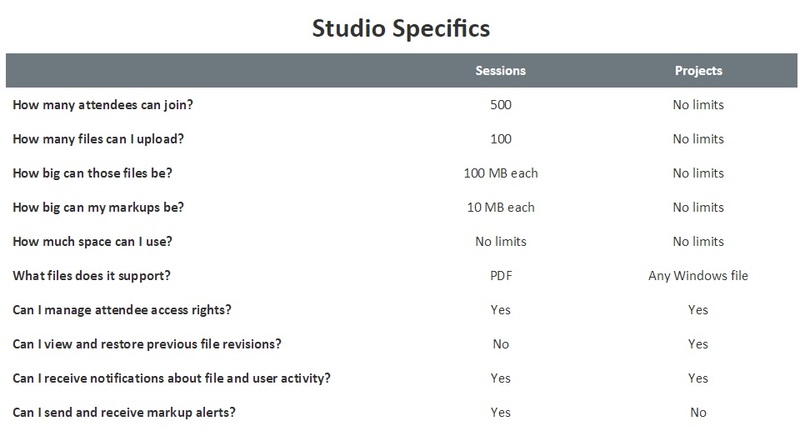 A sample of what you might want is shown below. Note that each State is color coded differently and that you will want to add a legend onto the floorplan so your owner know what each color means. Since you’ve read to the end of the post I’m also providing this download to my custom “Work Completed for Owner” Profile so feel free to modify the status colors and create your own legend. 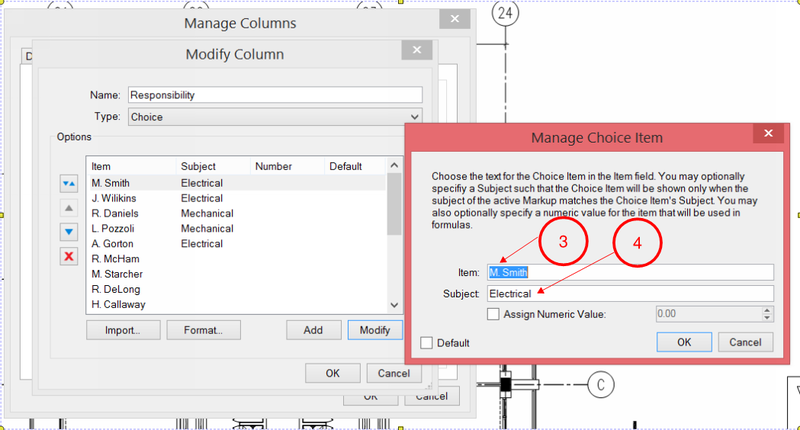 You can use similar methods for creating multilevel approvals for the punch and back check, design and constructability reviews, etc. 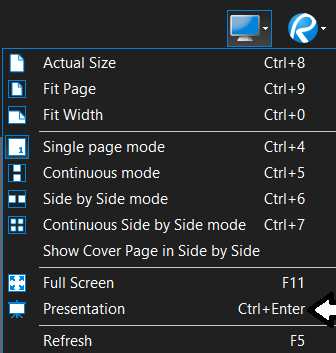 There’s another gift coming tomorrow so be sure to check back on this blog, especially if you need a few more Bluebeam Revu licenses. 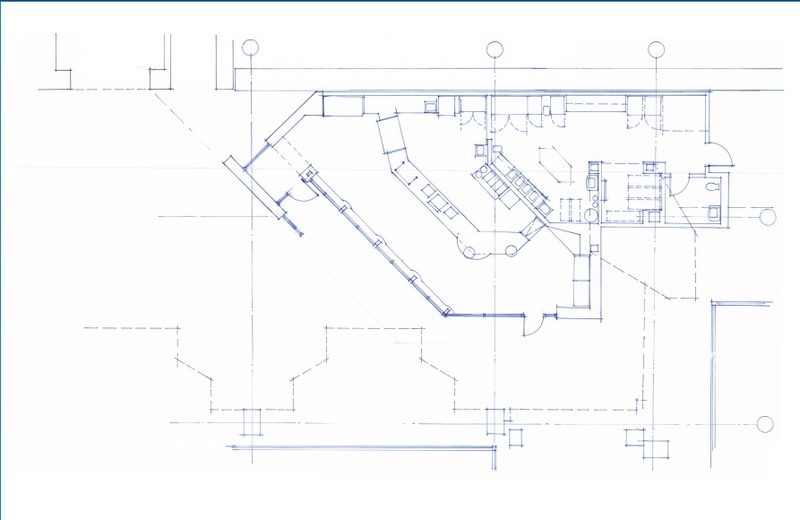 In our previous post, Complementing CAD, the architect had dotted lines to display the path of travel. So what if you need something more elaborate? 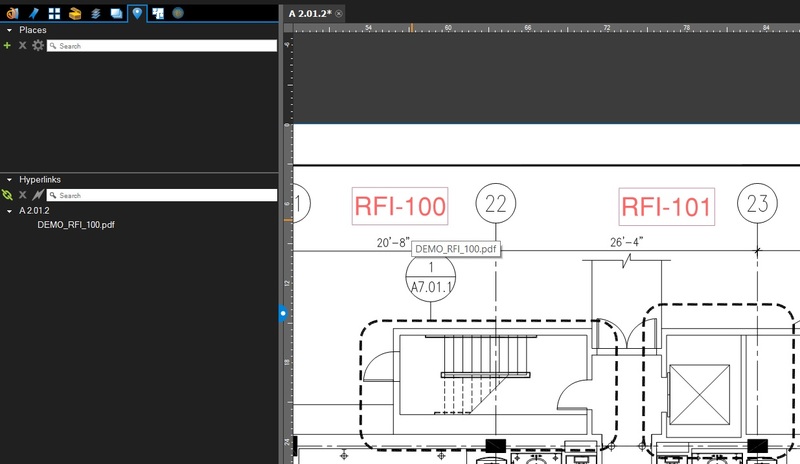 Bluebeam Revu has many line styles but did you know you can create your own? 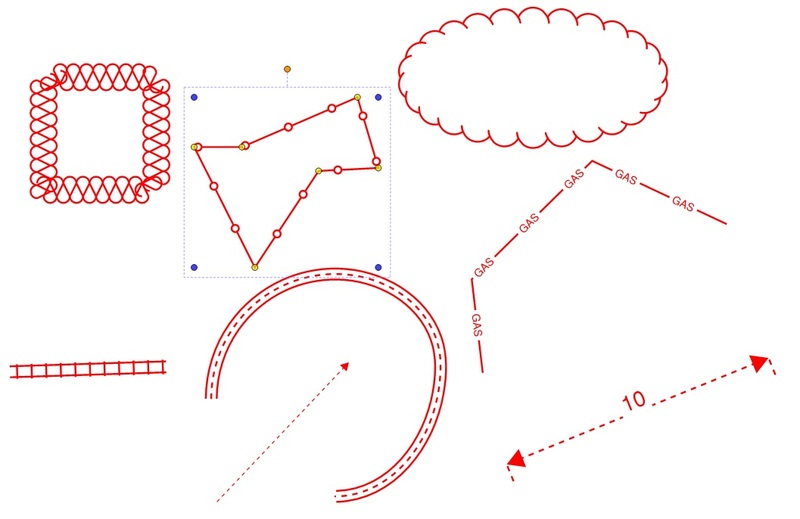 Line Styles for paths, roadways, pipelines, fencing, railways, boundaries and borders are often used in illustrations and appear on construction plans. 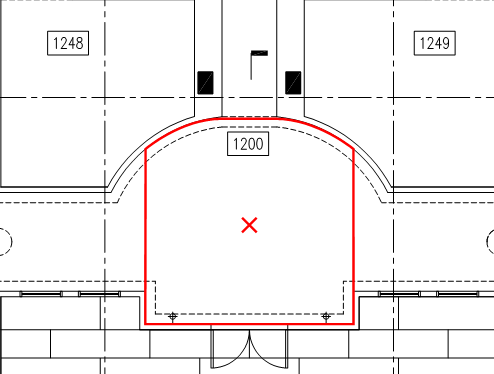 Custom line styles can be applied to Arrow, Ellipse, Line, Polyline, Rectangle, Polygon and Cloud markups. 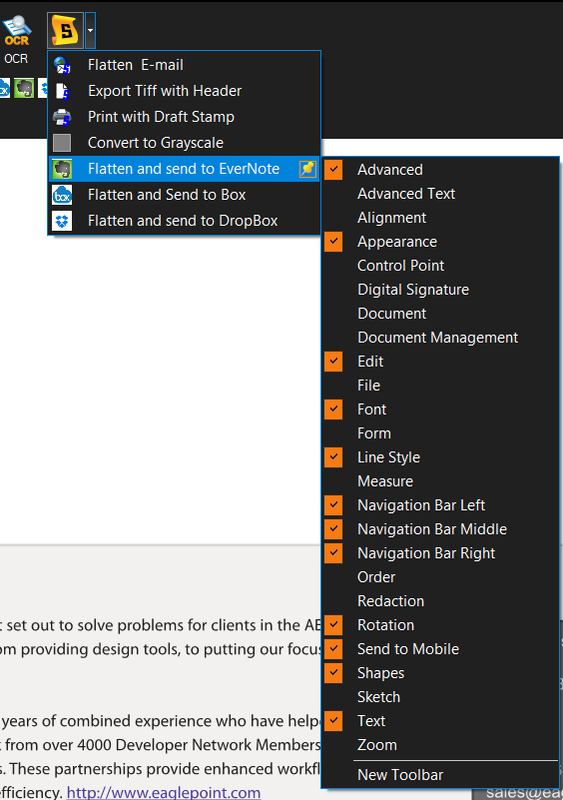 Use the custom Line Style editor to make your own custom line styles. 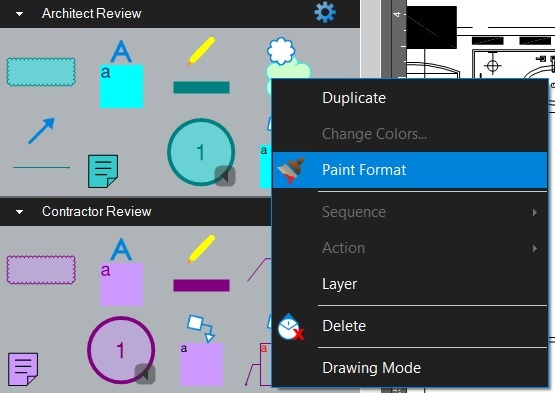 Custom line styles can be created using dashes, text, spaces, dots and vector graphics literally providing you with the option to create any shape or size. The custom Line Style editor gives you the ability to have multiple lines with varying characteristics that’s great for producing road patterns and other complex designs. 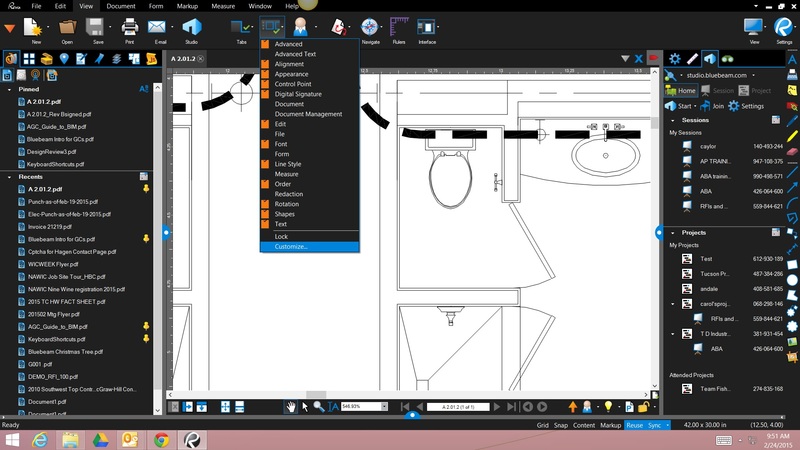 Here’s a Bluebeam video on how to make your own line styles and share them with your peers. Note: You can apply limited styles to the Dimension tool as well. What unique line styles have you created? Email me a few you’re proud of and I’ll append them to this post (with a kudos to you and your firm)! 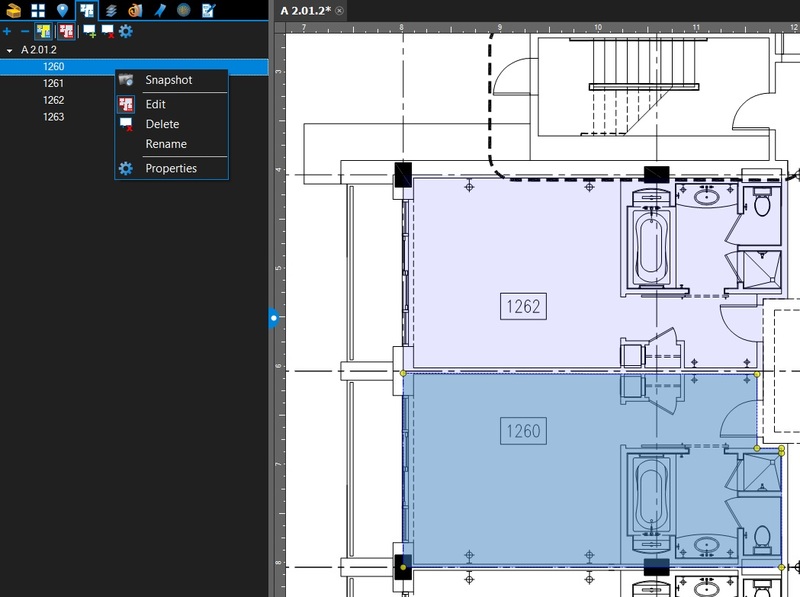 Posted by carolhagen in Bluebeam Revu, CAD. 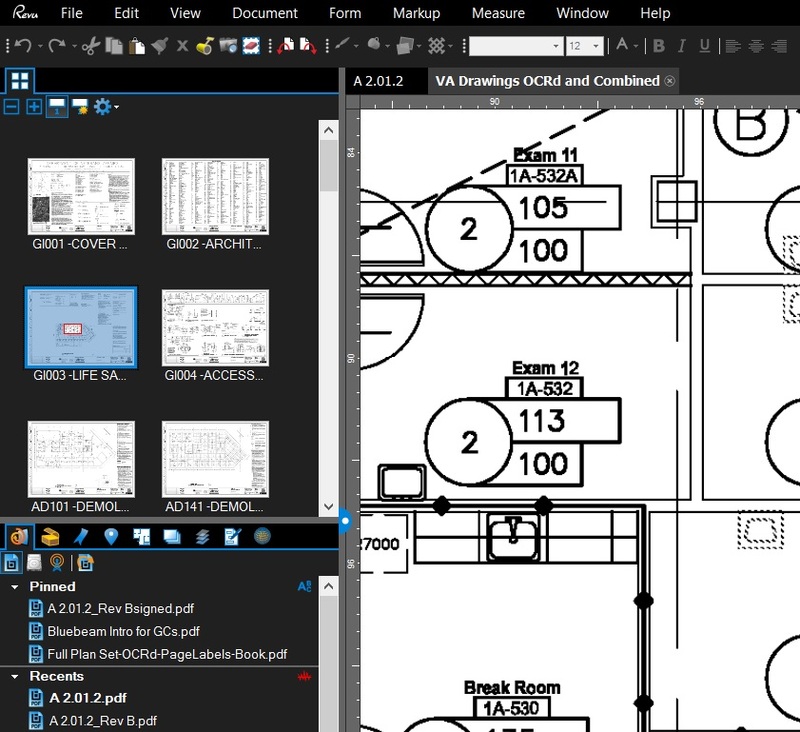 While many Architectural, Engineering and Construction firms use Bluebeam Revu to convert CAD to PDF, there’s an often overlooked capability that is as plain as the nose on your face. 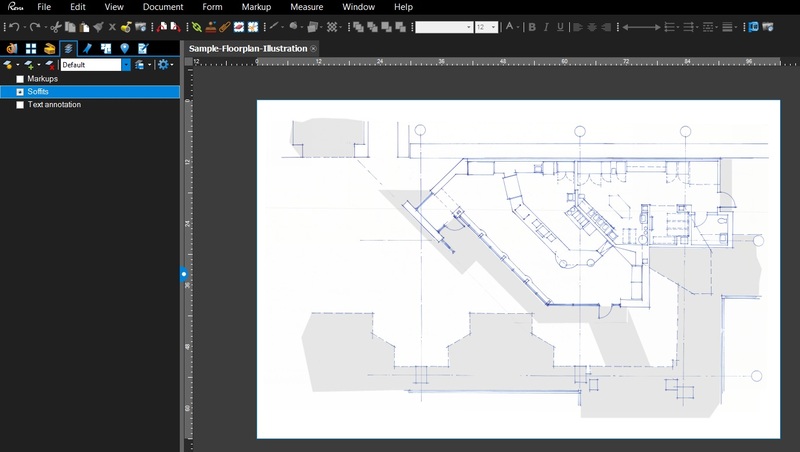 It’s sketching and creating floorplan illustrations. 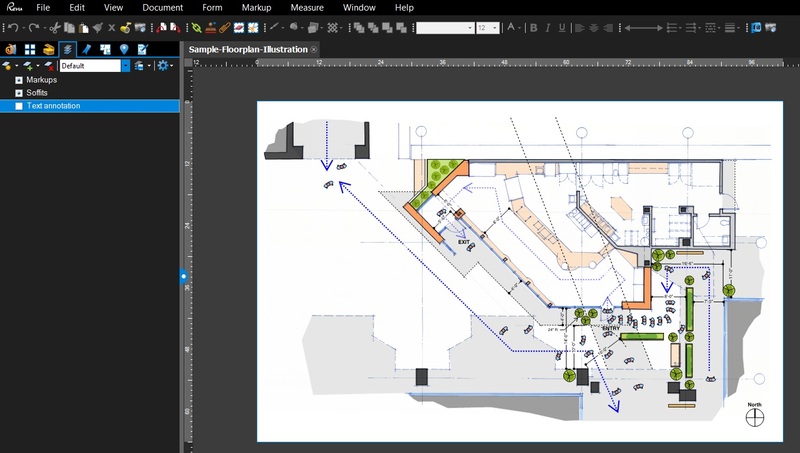 Luckily for us, he was willing to share a sample of his work in Bluebeam with this floorplan illustration (below), taking it from sketch to finished work. Overtime he has added custom tool sets into his tool chest copying some tools from CAD and creating others from scratch in Bluebeam. 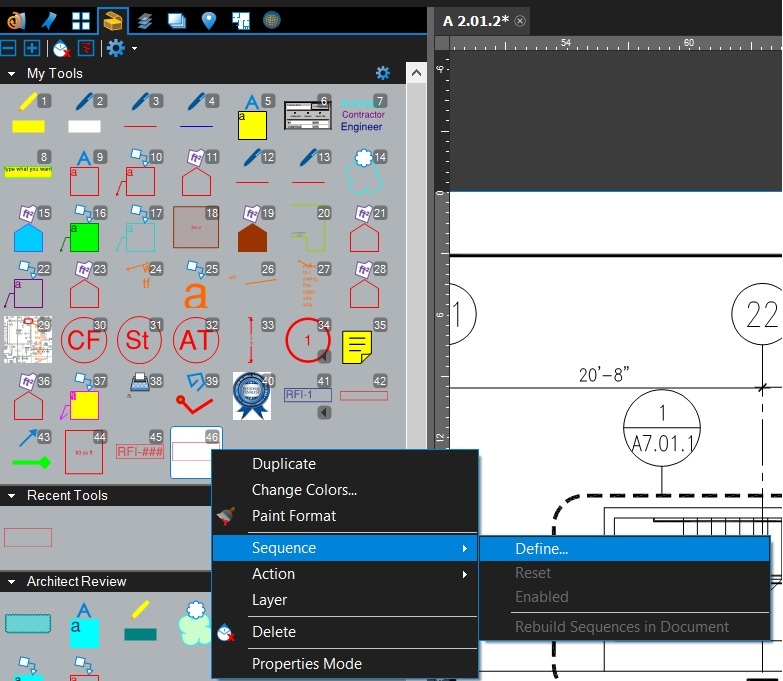 With the custom tool set features, you can have all your favorite symbols, illustrations, etc. right at your fingertips. Let’s take a look at Nathan’s work. Now let’s turn on the markups layer. Many of the tools here are part of his custom tool set. 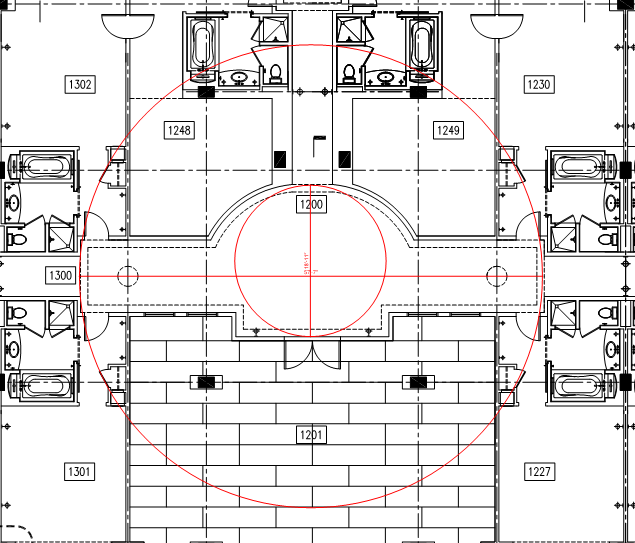 Finally the text is added for a professionally illustrated finished floorplan. All that’s left is to add the Architect stamp! A special thank you to Nathan Woods for sharing this with our readers. 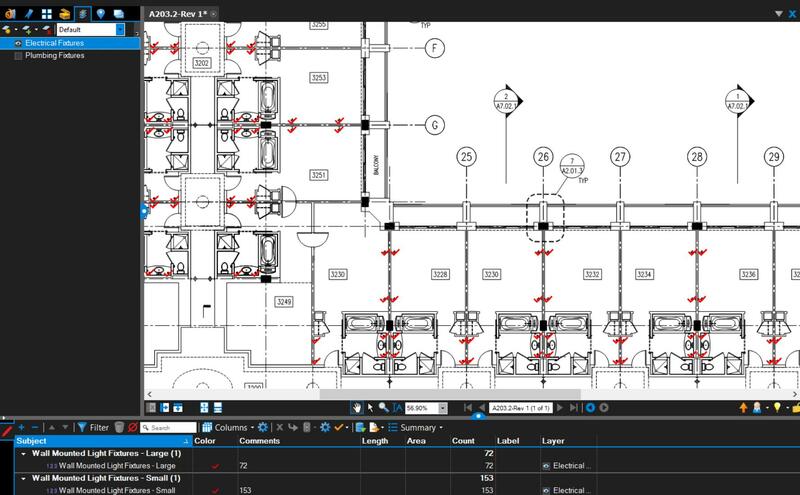 If you have created a timesaving tool or found another use for a Bluebeam and would like to be featured in an upcoming blog post, reach out to me on LinkedIn, Email Me, or tell us about it in the comments. 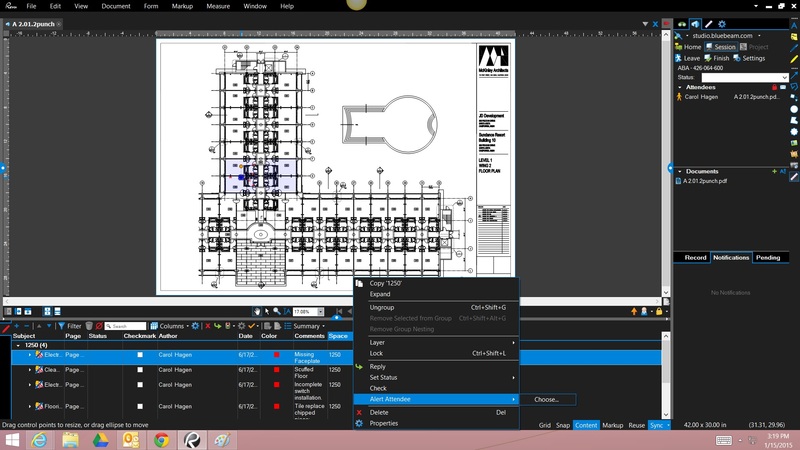 Want to learn more about Bluebeam Revu or need on-site training for your construction team and office staff? I am available and travel the United States providing in-house customized training for your Project Managers, Estimators and supporting office staff. To arrange for Bluebeam Training in your offices, Email Me Your Contact Info.